Good news: these BB-8 Cake Balls ARE the droids you're looking for, assuming you're looking for delicious cake balls decorated like cute Star Wars characters. These two-layer candies are made with moist cake inside and decorated to look like BB-8 from The Force Awakens. They're the perfect thing to serve at a Star Wars party! Don't miss our other Star Wars-themed candies: Chocolate-Dipped Wookiee Cookies, Pretzel Rod Light Sabers, and Princess Leia Doughnut Holes! Prepare and bake the cake mix according to the directions of the package for a 9x13 cake. Once baked, allow the cake to cool completely. Spoon three-quarters of the frosting into the bowl and stir with a rubber spatula (or your clean hands!) until the mixture is well-combined. It should be very moist and hold together if you squeeze a ball of cake between your fingers, but not too wet or greasy. If the cake mixture is still a bit dry, add more frosting to get it to the desired consistency—the exact amount you need will depend on the texture of the cake you started with. Scoop the remaining cake into 20 larger balls, about 1 1/2-inches wide. Roll them between your palms until they're round and refrigerate them until they're firm, at least one to two hours. When the cake balls are firm enough to dip, place the white candy coating in a medium microwave-safe bowl and microwave it until melted, stirring after every 45 seconds to prevent overheating. Using dipping tools or a fork, take one of the heads and submerge it into the melted candy coating. Remove it from the coating and drag the bottom across the lip of the bowl to remove excess coating. Replace the dipped candy on the baking sheet and repeat until all of the heads have been dipped. Refrigerate the tray until the coating on the heads is set, for about 15 minutes. Re-warm the coating if necessary and dip one of the larger cake truffles (the body). Place it back on the baking sheet and, while the coating is still wet, put one of the heads on top. Repeat until all of the bodies are dipped and have heads affixed. Refrigerate the tray again to set the coating. Pipe the decorations on the BB-8s: black circles on the head, a red accent, and orange and gray designs. Use reference photos to help you come up with a decoration scheme. If the coating starts to harden in the paper cones before you're done, re-warm it in 10-second intervals in the microwave just until it's workable. Once decorated, refrigerate the tray to set the cake truffles completely. 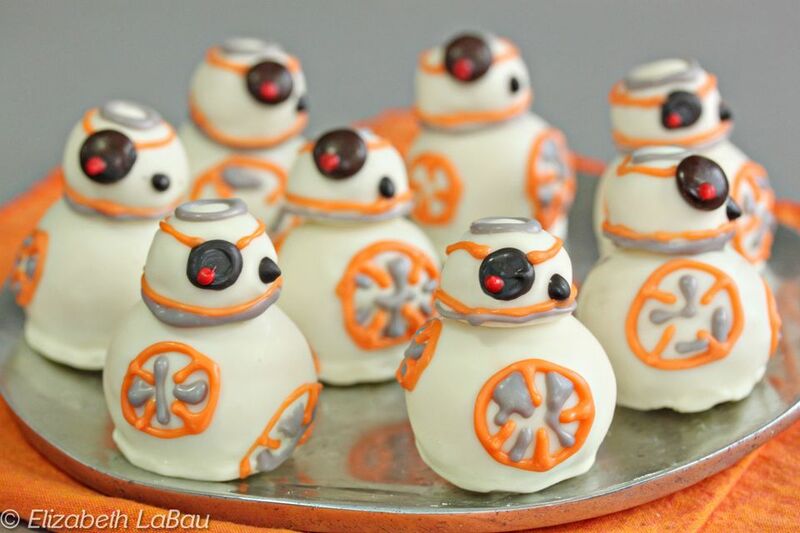 BB-8 Cake Balls can be stored in an airtight container in the refrigerator for up to a week.